24 multiple liquid-poured colours with high lightfastness in half pans. The basis range of AKADEMIE® Aquarell includes colours designed for students, comprising 24 highly concentrated watercolours (mostly 4 and 5 star lightfastness). High-quality artists' pigments and an optimum binder combination (natural gum arabic) guarantee brilliant mixtures and good applicability, even on softer watercolour papers. The sets include small and full pans in different compositions (10, 12 and 24 pans). AKADEMIE® Aquarell colours can be mixed and combined with HORADAM® watercolours as well as all AQUA mediums of Schmincke. There are specially developed watercolour papers which give the best results. Because the selection and the differences of the various sorts of paper are very wide, we have provided you with some guidance: Watercolour papers are available in various sizes, qualities, individually and in pads. They also differ in terms of manufacturing processes, in their surface finish and in their weight. Basically, you should make sure you use good quality paper and a minimum weight of 240g/m² and for larger formats at least 300g/m². For palette knife and structure work, the weight should not be less than 350g/m². 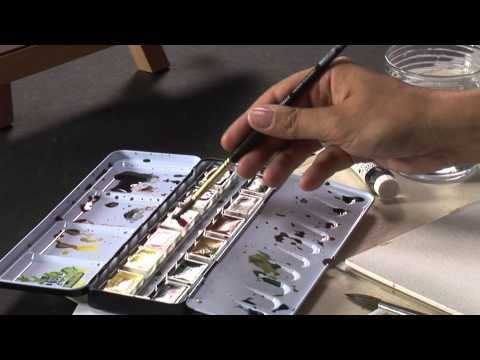 Alternatively, previously primed stretchers or painting boards can be used for watercolour painting. The different surfaces of the papers make a difference, because they influence the effect of the colour and the paint flow. Matt watercolour papers have a slightly grainy, barely structured surface. It is not easy to achieve clear colour demarcations if the colour runs more strongly towards the edges. Therefore, matt papers are particularly recommended for wet-on-wet techniques. Rough watercolour papers have a mild to stronger surface structure which influences the colour flow. They are just as suitable for opaque colour application as for the wet-on-wet technique. Dry colour application with granulating effect is also ideal on rough paper. It is just more difficult to achieve individual, fine detailed work. Smooth and silky papers support colour brilliance. Colours hardly run into each other and it is easy to work in fine detail. In contrast with other papers, however, it is not easy to make corrections on this paper. Brushes differ firstly in their form, secondly in the type of brush hairs. Essentially, for watercolour brushes your focus should be on quality. This is the only way to guarantee high colour absorption and elasticity, which is needed to achieve good results from your painting techniques. Real natural hair brushes of high quality are definitely the best (but also most expensive) brushes for watercolour painting. High-quality synthetic or mixed hair brushes, however, especially for beginners or when using the AQUA mediums, are a very good and robust alternative. Round brushes are most suitable for detailed work, flat brushes for forming effective lines and surfaces, liner brushes for precise lines and thick wash brushes for applying large areas of colour. In addition, there is a number of special brushes, such as the fan brush or a special brush for forming grasses and straws. It is also possible to use small sponges to obtain interesting colour application. Other tools are of interest for working with watercolour mediums. Spatulas and palette knives are used to apply primers and to create structures.